On April 9, 2019, Food security, sustainable agriculture and forestry, marine and maritimeand inland water research and the bioeconomy Open Horizon 2020 Societal Challenge 2 InfoDay was held within the framework of the National Contact Point (NCP) of the Horizon 2020 Framework Program in the thematic area “Food Security, Sustainable Agriculture, Marine and Maritime Research and the Bio-Economy & Biotechnology” at National University of Life and Environmental Sciences of Ukraine. Its main objective was to get acquainted with the BioHorizon-SC2 and KET-B NCP network, up-to-date Social Call Challenges 2 of the Horizon 2020 work program and BBI JU, the benefits of using the SME instrument in the Horizon 2020 program, as well as the opportunities for partnership development at the International Brokerage Event (Brussels, EU) within the BioHorizon project. Vadym Tkachuk, Vice-Rector for Scientific and Pedagogical Work, International Activities and Development, opened Open Horizon 2020 Societal Challenge 2 InfoDay. The moderator of the event was the Head of Food Security, Sustainable Agriculture, Marine and Maritime Research and the Bio-Economy & Biotechnology NCP, Liliia Kalachniuk. Bożena Podlaska, BioHorizon Coordinator, IPPT PAN (Poland) started Open Horizon 2020 Societal Challenge 2 InfoDay with the presentation of the BioHorizon-SC2 and KET-B NCP network, as well as acquainted the participants with the statistics about successful participation of Ukraine in the calls of Horizon 2020. Antoine Kiffer, ACTIA (France) provided detailed information on current Calls of Social Challenges 2 of the Horizon 2020 Working Program and BBI JU and focused on the specific features of “The Bio-based Industries Joint Undertaking (BBI JU)”. Willemien van Asselt, RvO (Netherlands) briefed participants on the benefits of using the SME-instrument in the Horizon 2020 program and expanding opportunities for small and medium-sized businesses. The reports on the implementation of successful Ukrainian projects of Horizon 2020 were presented, namely: Alla Kravchenko (NUBiP, Ukraine), “The experience of participation in the implementation of the Horizon 2020 program uP_running” & “AGROinLOG” and Tayisiya Symochko (Uzhhorod National University, Ukraine) “SKIN project”. A bright presentation by Michaela Pöter (Germany) on “Making the most of brokerage events” discloses in detail the creation of appropriate portfolios and other organizational elements for groups, collectives and representatives of institutions that are going to participate in the BioHorizon Brokerage Event “Food Security; Sustainable Agriculture and Forestry; Marine, Maritime and Inland Water Research; Bioeconomy; KET-Biotechnology” on July 3, 2019 in Brussels for the purpose of presenting, discussing and developing their projects at the international level, finding partners for international cooperation, initiating the creation of consortia for future projects of Horizon 2020 program, receiving the first-hand advice and support from the European Commission and National Contact Points (NCPs) in Europe. Potential members of this event can register (https://foodbrokerage2019.b2match.io/) at the end of April - early May 2019. All reports were actively discussed by the participants of InfoDay. BioHorizon team gave advice on the possibility of participation in the following calls of Horizon 2020 Program and EuroHorizon. 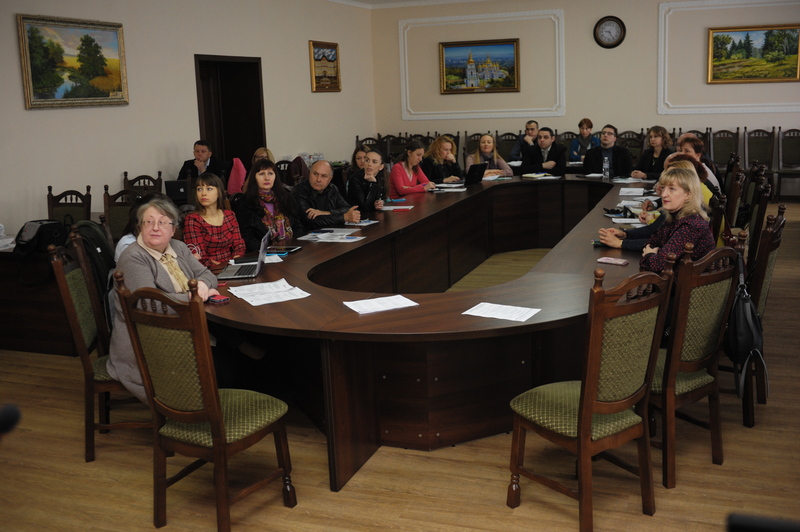 There were representatives of various faculties, the Council of Young Scientists of NUBiP of Ukraine and guests from other institutions, small and medium business enterprises and higher education establishments. We thank the administration of NUBiP of Ukraine for the hospitality and the hall provided in the 3rd University Building for InfoDay.